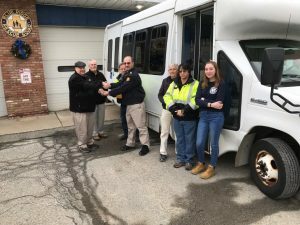 Augusta, New Jersey – SCARC, Inc. has been able to donate two retired wheelchair lift vehicles to our local Blue Ridge Rescue Squad in Branchville for their use in emergency services to the local community. The Rescue Squad’s plan is to convert the vehicles into emergency support vehicles to be used by the Squad in its jurisdiction surrounding Branchville, Frankford Township and Montague Township. Blue Ridge Captain Craig Fary thankfully received the keys for both vehicles from Tony Barile, SCARC Director of Facilities, Transportation and Risk Management. Several other Squad members attended the Key Exchange Ceremony. Captain Fary expressed his appreciation and gratitude to SCARC for giving the Rescue Squad an opportunity to receive vehicles to be used by the Squad during future emergency activities. Blue Ridge Rescue Squad has been a supporter of the SCARC organization for many years. Annually the Squad volunteers at the SCARC Walkathon event each May at the Sussex County Fairgrounds. This year’s event is scheduled for May 19, 2019. In addition, the Blue Ridge Rescue Squad was named as SCARC’s Volunteer of the Year at its 2018 Annual Awards Dinner at Perona Farms Restaurant. Members of the Squad have assisted SCARC individuals and Group Homes in the area with emergency services when required. In the photo, Blue Ridge Captain Craig Fary of the Rescue Squad accepts the keys from Tony Barile, SCARC Director of Facilities, Transportation and Risk Management. In the background is Barry Woodruff, SCARC’s Senior Coordinator of Transportation. Employment Opportunities Questions about SCARC?